Coming from India, a country where you drive in the opposite side of the road and the co-passenger sits where the driver sits here in this part of the world, it can all get a bit crazy. 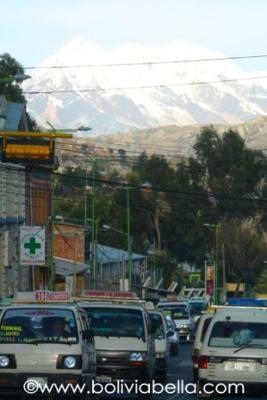 My intial days of driving in La Paz was terrifying. The very first day, I decided to take the wheels for a spin, I ended up driving on the wrong side, and scratching a car which went all screaming with its alarm beeeeping. The stress level was so high, and the low oxygen levels in the high altitudes made it all a clear possibility of a cardiac arrest. Secondly, all uphill for a person coming from a city which is all flat is no fun to drive either. 90% of the time your climbing on gear 1 and its slow and painful. The best I have been flat out was for 5mins at 80kmph on my way to zona sur on a day when traffic was low. My biggest irritation has been the public transport buses which are the Dodge 400 tin cans, which are slow and stop where they please without realising you have a few cars behind you. Secondly, you think wow these are vintage buses how safe are they? Well as they say prevention is better than cure, I stay way far behind them or way ahead of them. The other part of driving in La Paz is the radio taxis! They can be really rash and virtually like a video game of A.K.A. Road Rash, come head on to you. The best part is when your climbing uphill, these guys going downhill will pass first and make you halt dead and then do the painful climb up again. Guess if you do a world class driving test most of them would fail. Traffic signals are even more interesting for me. First in some points your not sure which way to look for the right traffic lights, secondly they are positioned in some places in a funny way when you stop at the STOP line you cant see the lights. But for me the it is the AMBER light. I see people pass through it and when I slow down to halt I get drivers honking at me. So I thought Amber means Caution its gonna be Red and not Hey hey pass pass ! Now that I drive a bit around, I have decided either I take all the time in the world and let the taxis pass and the impatient once go or, take the bull by its horns and give them a taste of their own medicine. So tried the second option and it works :) I took my vengeance back at a cabby who was coming up hill did not stop but went down hill and he was a bit stunned. So like they say, If you dish it out, be prepared to take it as well! !